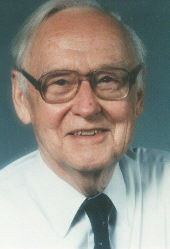 James Crow is Professor Emeritus of Genetics at University of Wisconsin, where he has taught since 1948. During his years at Wisconsin, Crow has served as chairman of the Department of Medical Genetics and the Laboratory of Genetics. He also served as Acting Dean of the UW Medical School for 2 years. Additionally, he has been President of the Genetics Society of America and the American Society of Human Genetics. Crow received his Ph.D. from University of Texas, Austin in 1941 and has been studying the population genetics of Drosophila and humans ever since. His research has ranged from investigations of the genetics of DDT resistance to the effects of small mutations on the overall fitness of populations. Crow has made numerous contributions to genetics, including: playing a significant role in the development of the concept of genetic load; writing the popular "Genetics Notes" guide for beginning genetics students (which has gone through eight editions and has been translated into several languages); and co-authoring the classic population genetics textbook, An Introduction to Population Genetics Theory (1970), with Motoo Kimura. Crow has also spent much of his career tackling profoundly difficult issues at the intersection of science and society. Indeed, from 1955-1983, he served on various National Academy of Science committees that focused on the biological effects of ionizing radiation. Recently, he turned his attention to the development of genetic identification technologies that are used to determine paternity and convict criminals. From 1994-1996, he chaired the NAS's Committee on DNA Technology in Forensic Science; and from 1998-2000, he chaired the Department of Justice's Working Group on the Future of DNA Technology. A truly interdisciplinary scholar, Crow has also made significant contributions to the literature on history of genetics. Since 1987, Crow has regularly contributed to, and served as co-editor of, the "Perspectives: Anecdotal, Historical, and Critical Commentaries on Genetics" section of Genetics (several essays written for this column were recently collected and published as an edited volume by University of Wisconsin Press). In addition, he has also published several articles in peer-reviewed historical journals. Crow is also an accomplished musician, and performed with the Madison Symphony Orchestra from 1949-1994. He served as President of the MSO from 1984-1986. J.F. Crow and A.P. Mange, "Measurement of inbreeding from the frequency of marriages between persons of the same surname," Eugenics Quarterly 12 (1965): 199-203. J.F. Crow and J. Felsenstein, "The effect of assortative mating on the genetic composition of a population," Eugenics Quarterly 15 (1968): 85-97. J.F. Crow, "Rates of genetic change under selection," PNAS 59 (1968): 655-61. M. Kimura and J.F. Crow, "Natural selection and gene substitution," Genetical Research 13 (1969):127-41. J.F. Crow and M. Kimura, An Introduction to Population Genetic Theory (New York: Harper and Row, 1970). M.W. Feldman and J.F. Crow, "On quasilinkage equilibrium and the fundamental theorem of natural selection," Theoretical Population Biology 1 (1970):371-91. J.F. Crow and T. Maruyama, "The number of neutral alleles maintained in a finite, geographically structured population," Theoretical Population Biology 2(1971): 437-53. M. Kimura and J.F. Crow, "The effective number of a population with overlapping generations: a correction and further discussion," American Journal of Human Genetics 24 (1972):1-10. J.F. Crow, "The dilemma of nearly neutral mutations. How important are they for evolution and human welfare?," Journal of Heredity 63 (1972):306-16. T. Nagylaki and J.F. Crow, "Continuous selective models," Theoretical Population Biology 5 (1974): 257-83. C.H. Langley and J.F. Crow, "The direction of linkage disequilibrium," Genetics 78 (1974): 937-41. J.F. Crow, "The theory of neutral and weakly selected genes," Federation Proceedings 35 (1976): 2083-6. M.J. Simmons and J.F. Crow, "Mutations affecting fitness in Drosophila populations," Annual Review of Genetics 11 (1977): 49-78. M. Kimura and J.F. Crow, "Effect of overall phenotypic selection on genetic change at individual loci," PNAS 75 (1978): 6168-71. J.F. Crow, "Genes that violate Mendel's rules," Scientific American 240 (1979): 134-43. 146, 1979 Feb.
J.F. Crow and C. Denniston, "The mutation component of genetic damage," Science 212 (1981): 888-93. J.F. Crow and K. Aoki, "Group selection for a polygenic behavioral trait: a differential proliferation model," PNAS 79 (1982): 2628-31. J.F. Crow, "Sewall Wright, the scientist and the man," Perspectives in Biology and Medicine 25 (1982): 279-94. J.F. Crow, "The Neutrality-Selection Controversy in the history of evolution and population genetics," in Ohta and Aoki (eds. ), Population Genetics and Molecular Evolution (Tokyo: Japanese Scientific Press, 1985), pp. 1-18. J.F. Crow, "Population genetics history: a personal view," Annual Review of Genetics 21 (1987): 1-22. J.F. Crow, "Muller, Dobzhanksy and Overdominance," Journal of the History of Biology 20 (1987): 351-380. James Crow, "Twenty-Five Years Ago in Genetics: Motoo Kimura and Molecular Evolution," Genetics 119 (1987), pp. ? J.F. Crow, "Eighty years ago: the beginnings of population genetics," Genetics 119 (1988): 473-6. J.F. Crow, "The ultraselfish gene," Genetics 118 (1988): 389-91. J.F. Crow, "Sewall Wright (1889-1988)," Genetics 119 (1988): 1-4. James Crow, "Twenty-Five Years Ago in Genetics: The Infinite Alleles Model," Genetics 121 (1989): 631-4. J.F. Crow, "Concern for environmental mutagens: some personal reminiscences," Environmental and Molecular Mutagenesis 16(1989): 7-10. J.F. Crow, "Fisher's contributions to genetics and evolution," Theoretical Population Biology 38 (1990): 263-75. J.F. Crow, "Anecdotal, historical and critical commentaries on genetics. R. A. Fisher, a centennial view," Genetics 124 (1990): 207-211. J.F. Crow, "Centennial: J. B. S. Haldane, 1892-1964," Genetics 130 (1992): 1-6. James Crow, "Twenty-Five Years Ago in Genetics: Identical Triplets," Genetics 124 (1992), pp. 395-398. A. S. Kondrashov and J.F. Crow, "A molecular approach to estimating the human deleterious mutation rate," Human Mutation 2 (1993): 229-34. J.F. Crow, "Advantages of sexual reproduction," Developmental Genetics 15 (1994): 205-13. J.F. Crow, "Motoo Kimura (1924-1994)," Genetics, 140 (1995): 1-5. James Crow, "Memories of Moto," Theoretical Population Genetics 49 (1996): 122-127. J.F. Crow, "Molecular evolution--who is in the driver's seat?," Nature Genetics 17(1997): 129-30. J.F. Crow, "Thomas H. Jukes (1906-1999), Genetics 154 (2000): 955-6. J.F. Crow, "The beanbag lives on," Nature 409 (2001): 771. This page was written by Jay Aronson on August 27, 2001.